Welcome to our blog, where we share news and updates about our vineyard and tasting room, share delicious recipes and food pairings, and stories of winemaking and travel. Though we planted our vineyard in 2015, we knew the real work (and fun) would begin in early 2018. As they say, time flies, and this March we will celebrate our tasting room's one year anniversary after opening on March 2, 2018. 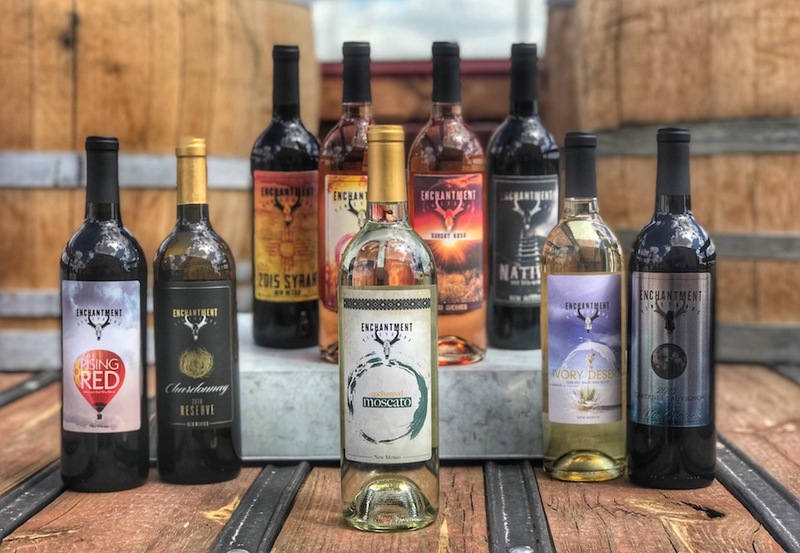 One spring afternoon in 2018, our winemaker called us with the news that we had won nine medals at the Fingerlakes International Wine Competition. We couldn't have been more thrilled with our first competition results! After only being open a few short months, receiving these esteemed awards from such a prestigious competition was incredibly validating and that our hearts were in the right place when we started this crazy vineyard plan. We hope 2019 will bring other medals! 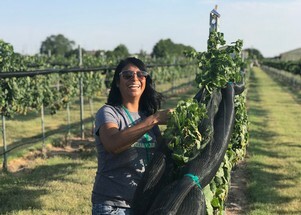 Harvest season in August and September meant meeting new friends and neighbors, as we put together a few crews of vineyard pros and volunteers. Spending time with each and every vine gave us an intimate opportunity to hand-pick our grapes, tasting the fruits born from our Portales soil. Time-consuming? You bet. Worth it? Absolutely! Later this spring, we hope to give some wonderful updates on our grapes, how they're growing, and a look into some of the science before the bottle. By summertime, stay tuned for updates on Harvest 2019 if you wish to join us as one of our volunteers for a unique Portales experience! In September, we hosted our very first Chef's Table event, which featured delicious foods from our friend Chef Jason Morse and 5280 Culinary. One hundred guests joined us for a beautiful evening outside, and we were grateful for New Mexico weather cooperation. 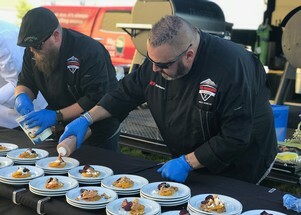 Jason and his team not only served some truly delicious plates, but he also cooked in front of everyone with a serious repertoire of outdoor grilling and smoking equipment! Come for the food and stay for the grilling education. Response to the event was tremendous and we look forward to possibly teaming up with Jason again soon. Stay hungry, Portales! 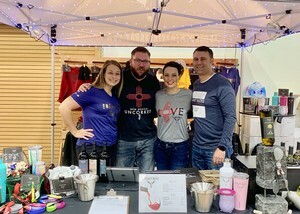 We finally made our way to our first New Mexico wine festival in February 2019. Vines in the Pines was an exciting event that was full of wine making friends from around the state, as well as new customers from great cities like Las Cruces, New Mexico and El Paso, Texas. Along with 13 other participating vineyards and wineries, we had an absolute blast sharing ten of our wines with ticket holders to this amazing event. Standout favorites for the festival included our Chambourcin, Rising Red table wine, as well as our award-winning Enchanted Moscato. After learning so much and making new friends through wine, we hope the rest of 2019 is just as exciting. We're looking forward to hosting more events, new wine release parties, special pairing events, and dinners that celebrate wine. Stay tuned for the first of these events beginning this spring, with the return of our popular wine and cheese pairing event with local gouda and more! As always, we love to hear your feedback. Get in touch with us on social media (Facebook, Instagram) or email us. From our family to yours, thank you for an amazing year one. Cheers! Before opening the doors to our tasting room in February, we entered all of our wines into the Finger Lakes International Wine Competition, the largest international wine competition held each year in Rochester, New York. The competition features international judges who taste each wine in a blind flight. Our ever popular (and customer favorite) Enchanted Moscato brought home a silver medal from the competition. 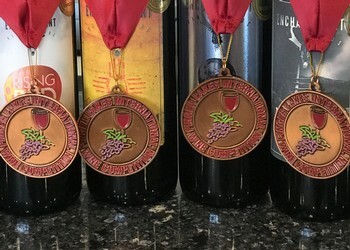 We also earned eight bronze medals for: Cabernet Sauvignon; 2016 Reserve Chardonnay; Sunset Rosé (dry rosé); Native Red Dry Blend; Ivory Desert Pinot Grigio; Rising Red; Syrah; and Sunrise Rosé (sweet rosé). We couldn't be more proud of our debut on the international stage and we are honored to be listed among many top-performing wineries and vineyards around the world. You can learn more about the Finger Lakes International Wine Competition and its fundraising for Camp Good Days by visiting their websites. Enjoy this fun behind-the-scenes look at what it's like to be on the cart at Finger Lakes!